Veteran CBS reporter, Dan Rather describes his call from Dallas to CBS confirming the death of President John F. Kennedy on the fiftieth anniversary of the assassination, November 22, 2013. Dan Rather, a young reporter for CBS News, was the first to report that President John F. Kennedy was dead. Not waiting for the official announcement, Rather said he had collected enough information from a hospital official, a doctor and a priest to convince himself that Kennedy was dead. 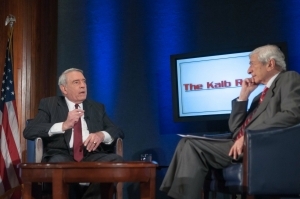 Through the prism of a half-century since President Kennedy’s assassination, two veteran CBS correspondents who were reporting that day –- Rather in Dallas and Marvin Kalb in Washington –- examined Friday on “The Kalb Report” what happened that day and its impact on the nation. The program took place on the actual anniversary of the assassination, and hundreds of people crowded into the ballroom to watch. Kalb noted that while CBS Radio News ran with Rather’s report, CBS Television News and Walter Cronkite waited 12 or 15 minutes for the official report before announcing it to the nation. Kalb said he was reporting from the State Department when he heard the radio report that the president was dead. Despite all of the books, movies and television shows that have conjured conspiracy theories about the assassination, both Rather and Kalb believe Lee Harvey Oswald acted alone in killing Kennedy. But what was the first thought that popped in your mind when Jack Ruby shot Oswald? Kalb asked. “Incredible, almost unbelievable that the assassin has been assassinated in the police department; you couldn’t make this up,” Rather said. “I understand the doubts about Ruby. He was a local nightclub operator known to police. He had some Mafia connections. Kalb said that as the CBS diplomatic correspondent, he was amazed by the wealth of information about Oswald that was released on the afternoon of the shooting. Oswald had been in the Soviet Union, he returned with a Russian wife and child. He might have visited the Soviet embassy in Mexico City. What would have happened if Kennedy had not been assassination but re-elected in 1964? Rather said it was not certain Kennedy would have been re-elected, and if he had, Rather doubted that the civil rights legislation passed during the administration of President Lyndon B. Johnson would have made it through in a Kennedy administration. The “Kalb Report” is a joint project of the National Press Club’s Journalism Institute, the University of Maryland University College, George Washington University, Harvard’s Shorenstein Center on the Press, Politics and Public Policy, and the University of Maryland’s Philip Merrill College of Journalism. It is underwritten by a grant from the Ethics and Excellence in Journalism Foundation.